Have you also experienced this phenomenon, where once a new thought or idea enters your life, it keeps springing up everywhere, or you begin to take notice of it because you’re aware of it now? It certainly happens to me. For instance, in the initial years of my stint in the UK, I had no need of a vehicle, and therefore had not the slightest interest in cars, and paid no attention to them on the street, or if someone gave me a ride in one. But when necessity demanded that I purchase one, and I acquired a Nissan Micra hatchback (and I got teased a lot by my colleagues for choosing something so nondescript, not something flashier), suddenly as if by magic, I began to ‘find’ them everywhere. I‘d notice them on motorways, in parking lots, in hospital digs. More recently, I was preparing our concert programme for Child’s Play India Foundation’s annual Christmas concert (10 December 2016, 6.30 pm, Menezes Braganza hall) several weeks ago. We have with us a visiting musician, Juilliard-trained cellist-conductor Avery Waite, and he had sent across via email an assortment of music to choose from, that our Camerata Child’s Play India could play under his baton. There was the Christmas music, of course, but another piece caught my fancy as well: a work called ‘Miraj’, for string ensemble, by American composer John Meyer. I was intrigued by its title. I know Miraj to be an important railway junction (trainspotters might know it once had all three rail gauges; broad, narrow and metre gauge), but hadn’t imagined that there would be music inspired by it. It is certainly a Western take, almost a stereotypical one, on India. And it seemed apt to have it performed in India under the baton of another American musician. But the reason behind the title still sort of eludes me. I got the Indian reference; but why Miraj in particular? I decided to look it up. And I learnt that the southern Maharashtra city of Miraj is renowned for its nurturing of Hindustani classical music, with an annual music festival at the dargah of Ustad Abdul Karim Khan (1872-1937), the great classical music singer of the Kirana Gharana. It is also famous for its rich tradition of handcrafting of Indian musical instruments, especially the sitar, but also the sarod and tanpura. Perhaps this piece is a salute to the rich music tradition of Miraj? While looking all this up, I again stumbled upon a look-alike, sound-alike word I had come across quite recently, while researching a work played by Marouan Benabdallah, Dia Succari’s ‘Night of Destiny’. While reading about this, I had come across Mi’raj. Israa and Mi’raj are two parts of a night journey by Prophet Mohammed in the year 621 from Mecca to Jerusalem (Israa), and the ascent to the heavens (Mi’raj, which in Arabic literally means ‘ladder’), described in the Quran and in the Hadith literature. 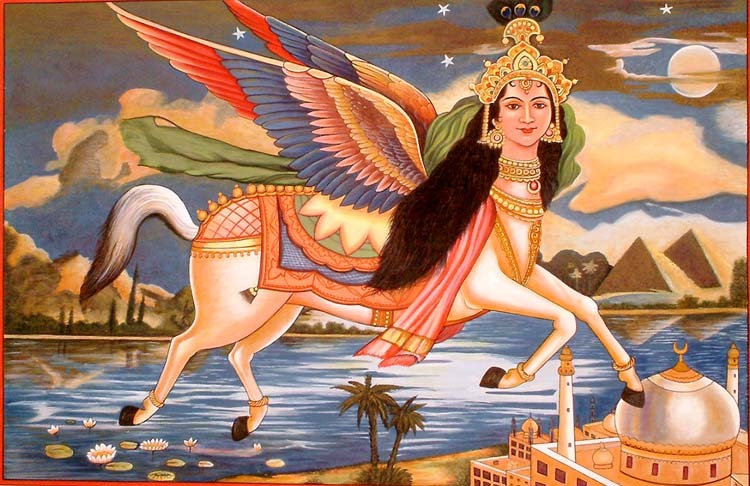 The journey is undertaken on a beautiful steed named Buraq. In painting and sculpture, it is represented with a human face, and in the feminine, even though this is not explicitly stated in the sources. I paid a visit to the Asian Civilisations Museum in Singapore as there was an exhibition titled ‘Port Cities: Multicultural Emporiums of Asia (1500-1900)’ that had just opened while we were in the city, and I hoped it would give some attention to our own port cities, including Goa, and I was not wrong. But more about that another time. While finding my way about the museum, I was drawn to the grand piano in a corner of a large room, and I was told that music concerts are regularly hosted in this space. And right next to it, as I was preparing to move on, I found the word ‘Mi’raj’ and stopped short. 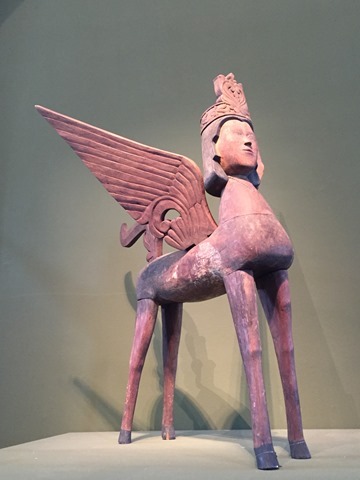 Perched on a pedestal and looking away from the piano was a majestic representation of Buraq in wood (provenance Mindanao, Philippines, early or mid-20th century), “half-mule, half-donkey with wings”. The placard below it informed me that although the Buraq is not uncommon in Islamic art, sculptures of it seemed unique to the Philippines. It added that “it is possible that the flourishing carving industry of religious images for Catholic Filipinos may have encouraged the making of such sculptures.” This cross-pollination of the arts and craftsmanship across faiths is always such a balm, especially at a time when we are constantly submitted to a barrage of news that makes one hate, turn away and stop engaging with the other. What was the purpose of this sculpture? Was it decorative, to adorn a wealthy home? If so, where in such a home would it have stood? It left one guessing. And just a few days later, I found a whole article on scroll.in (“From Islamic sculpture to contemporary Delhi: A visual history of Buraq, the Koran’s winged horse”) dedicated to “the enigmatic steed”). And I was interested to find it gave prominent place to an installation ‘Say Hello to the Hauz’ (2010), brainchild of Goa-based designer and film-maker Vishal Rawlley. Situated in the middle of a reservoir (Hauz-i-Shamsi) in Mehrauli, Delhi, the quirky exhibit allows you to ‘dial up’ and therefore light up an incandescent representation of Buraq. Why Buraq? According to legend, the hauz was built in 1230 AD by Sultan Shamsudin Iltumish, following a dream in which the Prophet commanded him to build a reservoir at a spot marked by Buraq’s hoofprint, and the Sultan found the hoofprint at this spot. I spoke to Rawlley about his project, and it is such a heartwarming example of art with a social purpose. He used to live next to the Hauz-i-Shamsi, and wanted to do something to change the appalling condition it then was in, and attract positive attention to it. His Buraq exhibit was on at the Hauz for two whole years and generated a lot of excitement not just locally but across the world, with people from overseas calling and skyping in to light up the installation. Even now,the area is considerably cleaner and well-maintained, and popular with locals as a place of relaxation and recreation. Buraq unsurprisingly lends her name to two airlines, in Libya and Indonesia. The ‘Miraj’ work by Richard Meyer may have nothing to do with Mi’raj and Buraq, but it will certainly take you on a flighty musical adventure. Fasten your seatbelts!